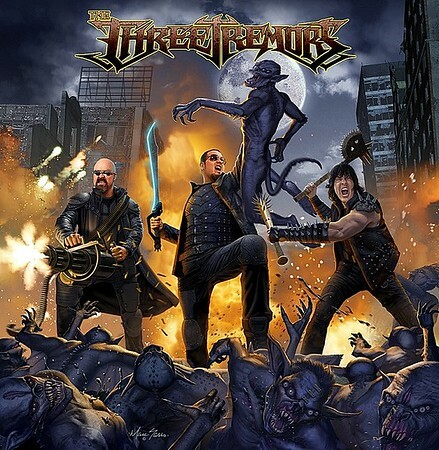 Initially the name The Three Tremors had been used for a potential project involving Rob Halford, Bruce Dickinson and Geoff Tate in 2000; but that came to nothing, possibly because Dickinson wanted Ronnie James Dio involved rather than Tate! Years later it is ironic that former Judas Priest singer Owens is involved in the band now. He is also its most well-known contributor, having famously fronted Judas Priest from 1996 to 2003 before going on to front Iced Earth, Yngwie Malmsteen’s Rising Force, Beyond Fear, Charred Walls of the Damned and Dio Disciples. The idea to resurrect The Three Tremors concept came from Sean Peck who has fronted the band Cage since 1992 – he met Owens for the first time when Cage supported Judas Priest in San Diego. Peck also provides vocals for Death Dealer, Denner/Sherman and Warrior. The third vocalist is Harry Conklin, best known as the frontman for Jag Panzer since 1981 (with a couple of breaks). He has also performed with Satan’s Host and Titan Force. The three vocalists are joined by guitarists Dave Garcia and Casey Trask, bass-player Alex Pickard and drummer Sean Elg.